Four times the savings! 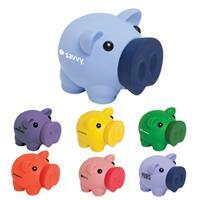 Start saving today with our 4 slot savings bank. 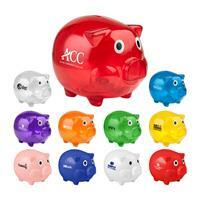 Great for banks, schools and credit unions. 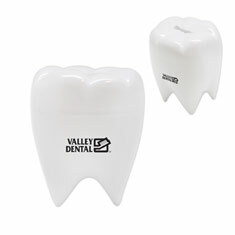 Add your logo and use as a giveaway at tradeshows. Removable plugs on bottom to retrieve money. Available in blue (S29000X) and red (S29001X). 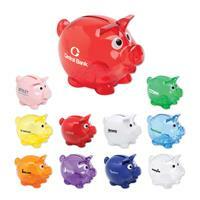 Your client's brand will be on the road to recognition when we place their logo on this car savings bank. Removable plug on bottom to retrieve money. 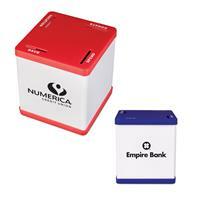 This bank is a perfect promotional giveaway for car dealerships, insurance companies and collision repair shops. Available in translucent blue (S9809X) and white (S9808X). 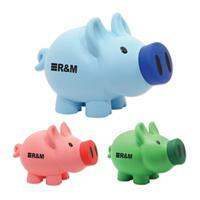 Watch your savings grow to astro-nomical proportions with this star bank. 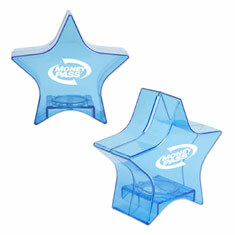 Made of plastic and measuring 5" this shining promotional product is ideal for your custom imprint. Removable plug on bottom to retrieve money. 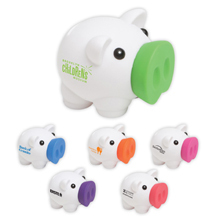 Choose from 17 imprint colors, add your logo and use as a giveaway at tradeshows! 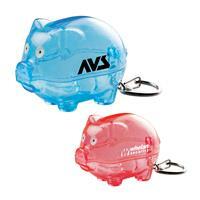 Great for banks, schools and credit unions. Would make a perfect novelty item for a museum or amusement park gift shop! This lightweight 3 1/2" plastic combination safe bank would make a perfect item for hotels, offices and dorm rooms! Ideal for tradeshows and employee incentive programs. You have the option of adding a custom imprint or selecting a blank product; depending on your project needs. Available in blue (S9333X), green (S9331X), and red (S9332X). Closeout Price! Available while supplies last!